Last week, the bf's mom calls because she wants my help with the bf's sister's baby shower next month. My inner Martha lept at the chance to lend my creative juices to such a project. I was told the colors for the shower were lavender and celery green. 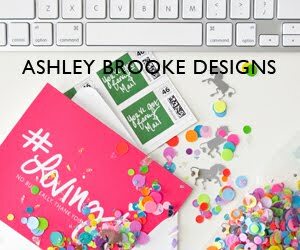 I decided to create a super simple invitation using the colors and a pretty font (momma to be is tres low maintenance and easy to please...if only I could be more like her). 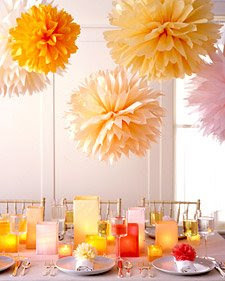 I also thought we would create some hanging pom poms in the colors to hang over the table with all the treats. 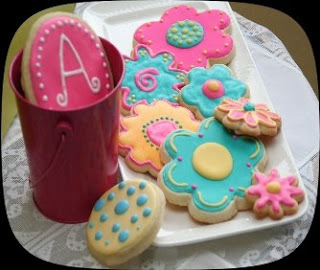 Specialty iced cookies will serve as the favors--flower designs in the colors, individually wrapped in little cellophane bags! The menu is still up in the air but I think a white eyelet table runner will look nice and crisp among the lavender and green details. One menu item I am certain of: mini cupcakes from Sweet! by Good Golly Miss Holly--so cute and yummy! I'm looking forward to it...now if only momma would settle on a name so I can buy baby girl to be fabulously monogrammed things! Good Job!! Love the cookies! Super cute!! !I love that font - what is it?? Adorable! What a great girlfriend you are! so CUTE! love the floaty pom poms! I love green and purple together...and the invite looks great! baby showers are the best! !